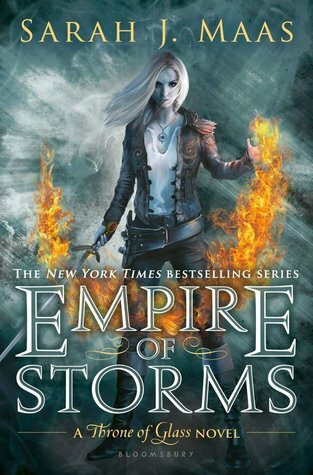 Review in a Nutshell: Empire of Storms is a fantastic entry in the Throne of Glass series. Despite a few notable flaws, this world continues to amaze me. Empire of Storms takes place after the events of Queen of Shadows, following the characters after the explosive conclusion of the previous book. They still have much to do to stop Erawan and saving their Kingdoms, and hopefully, live through this war. This book really uses the world that has been built in the previous novels. All of that worldbuilding and exposition pays off in how it is utilized here. That said, there are even now still new things to learn about the world of Throne of Glass, and those things are managed well. Sarah J. Maas’ writing style hits a low point with this book. It is still beautiful and descriptive, with entertaining dialogue, but a lot of it feels repetitive. Words like ‘male’ are used constantly and it gets a little annoying. Maas has also changed a lot as a writer while publishing this series, and that change is most notable in this novel. There is a lot more emphasis on the romance and steamier scenes, which take away from the plot and just weren’t what I wanted to read. I’ll get more into that next. Overall, while her writing was good and has the Sarah J. Maas tone we’ve grown to love, it also became less original and interesting now that we’re on book 5 in a series where every book is 400-700 pages. It gets tired. The plot of this book was interesting, with plenty of action scenes and tense moments. The pacing, on the other hand, felt a little sloppy at times. This could be due in part to that change I mentioned before. There was a lot of focus on the romances between the pretty much every character. No character could go without their (straight) love interest. While I did enjoy some parts of it, it wasn’t what I loved about this series. It lost that balance that was so great in the first few books. However, there are a lot of plot threads from the earlier books that weave into this one really well, which made up for the lack of balance for me. I loved seeing the callbacks to previous books and the novellas (which, by the way, you need to read before reading this book). It left me dying to see where the final book will take this series. The Throne of Glass series captured my heart with it’s unique and entertaining characters. Since it’s rise in popularity, characters like Aelin have taken center stage of so many books, and now I’m a bit worn out. She’s a little much for me. With each new book she’s starting to feel less and less realistic, but I still love her and all of the other characters so much. Sarah J. Maas has continued to keep me interested in their relationships and their lives for years. Cons- Romance heavy, awkward pacing, and repetitive writing. Empire of Storms will captivate you while you read, but it’s difference from the books where it all began can be striking. Hi. I read your review about the Assassin’s Blade. I glanced though this review. I didn’t want to run into any spoilers in this. I just posted a book review about The Assassin’s Blade.